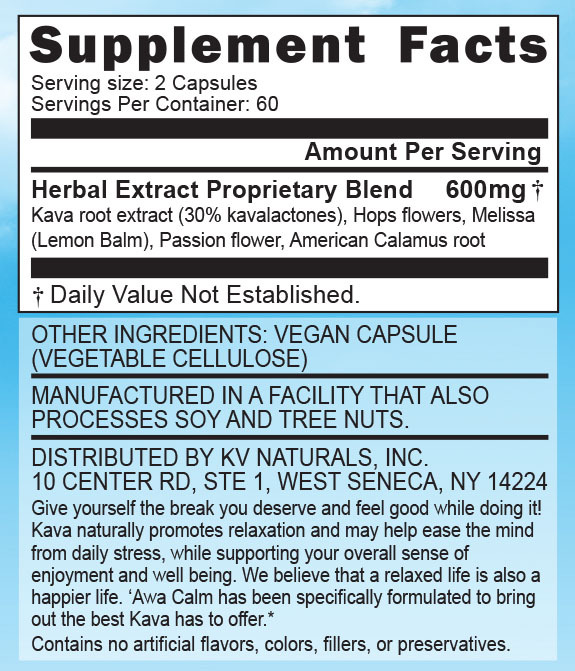 ‘Awa Calm is a flagship Kava-based product and a supercharged anxiety-reducer. Developed in our R&D facility in California, we are so proud of ‘Awa Calm; our Kavalactone extract-based capsule that takes the best of what Kava Kava has to offer and amplifies it into an extraordinary calming experience. * How do we do it? Through an expertly-blended proprietary formula, we achieved peak effects. Each capsule delivers a full dose of 2-4-6 Kavalactone (the “happy” Kavalactone combination), accompanied by the best herbal relaxers currently known. First, we add some organic Hops; proven for its calming effects. Then, we add ample amounts of Lemon Balm as it’s a proven natural stress reducer. After that, we blend in enough Passion flower to release and support the anxiety-reducing powers of Kava. Last is a personal favorite of mine, and one of our favorite herbs to mix with Kava; American Calamus Root. 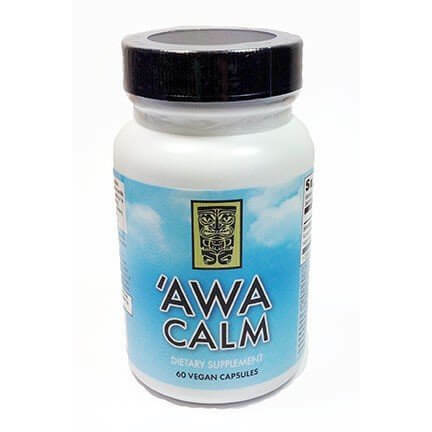 It’s just plain pleasurable and a perfect way to round out the anxiety-attacking ‘Awa Calm formulation that lasts for a solid two hours per serving. * Directions: Take 2 capsules up to 3 times per day. Do not exceed 12 capsules per day. Maximum period of daily use: 3 months. Use may resume for 3 months after a 2-week break. 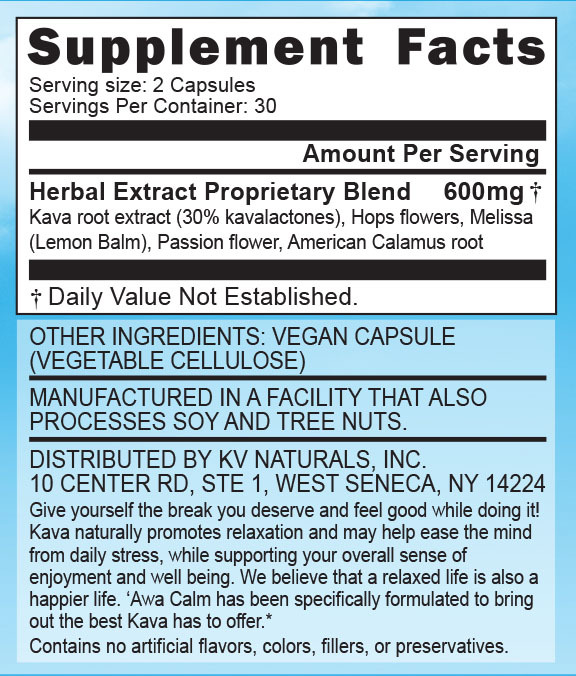 This product is based on a strong 30% kavalactone extract of Kava, so please use with caution and care. With the synergistic effects that our carefully-crafted herbs, this can be a surprisingly powerful natural stress reducer. Several of our staff here have integrated it into their daily routine. I personally use it almost every evening to help me ease into the night, and give me some of the best rest I’ve had in quite some time. Some over the counter medications give me vivid dreams (not what I want when I’m trying to sleep), but ‘Awa Calm doesn’t leave me drowsy in the morning, and it’s gentle enough to use during the day if I wish as well if I need to simply kick back and relax. Caution: If using prescription medications, seek the advice of a health care professional before using this product. Not to be taken during pregnancy or if breastfeeding. Not for use by persons under the age of 18 years or with alcoholic beverages. Keep out of reach of children. Used in excess or with substances that induce drowsiness, the ability to operate heavy equipment or a vehicle may be impaired. *These statements have not been evaluated by the Food and Drug Administration. This product is not intended to cure, treat, diagnose or prevent any disease. 60 Capsules 18 Kava Points, 120 Capsules 33 Kava Points.